China is the world’s largest importer of commodities. Number one oil importer. Number one iron ore importer. Number one copper importer. When commodity prices fell sharply in 2014, it was easy to find evidence of its balance of payments impact. Saudi Arabia swung into current account deficit. The Russian ruble fell sharply. Brazil sunk into a deep recession. Global trade fell, as emerging markets cut back on their imports. The terms of trade shock was showing up pretty everywhere one would expect—except in China’s current account balance. That was the dog that didn’t bark. At least not as loudly as expected. China’s current account surplus didn’t rise by anywhere near as much as China’s goods balance. * The reason, it turned out, was that China revised its methodology for calculating tourism imports, and the tourism deficit (travel in the balance of payments) soared, partially offsetting a growing goods surplus. In a new working paper, Anna Wong of the Federal Reserve Board’s international staff shows China’s current account surplus likely did jump by more than reported in 2014 and 2015. China’s pre-2015 methodology seems to have undercounted China’s tourism imports. It thus slightly overstated China’s 2003 to 2013 current account surplus. But China’s post-2014 methodology almost certainly overstates China’s tourism imports (and its overall travel deficit). It thus understates China's true current account surplus. China changed its methodology again this year (see appendix A of the Anna Wong paper, there are charts comparing the 2015 and 2017 revisions). It now overcounts tourism imports by a bit less, but it also seems to be undercounting tourism exports rather significantly. Go figure. The net impact on the current account hasn’t changed much. Full disclosure: Anna and I used to work together at the Treasury, so I am not surprised by her results. Anna though has gone way beyond simply looking at China’s partner data, and seeing if China’s reported imports line up with the tourism exports of China’s trading partners (they don’t). She calculated a gravity model of tourism trade. She estimated “norms” for tourism imports for a given level of development (higher income means more tourism spending) and then used those norms to estimate the deficit that should be associated with given number of tourists. And so on. All three of her methodologies imply that China is now overstating its tourism imports. And all three imply China’s tourism deficit is probably overstated by just under a percentage point of GDP. With more reasonable tourism imports—imports in line with past trends rather than the 100% year-over-year growth now in the 2014 data—China’s current account surplus likely rose to around 4% of GDP back in 2015. China’s current account surplus subsequently has fallen a bit, for real I think: the credit stimulus and the lagged impact of the yuan’s 2014 and 2015 appreciation combined to bring down the 2016 surplus—though Anna’s model suggests the surplus remains a bit higher than officially reported. There is a bigger point here. A large share of the post-crisis adjustment in China’s current account surplus has come from two hard-to-verify components of the current account, not from an adjustment in China’s goods balance. Much of the adjustment is in what the British used to call “invisibles”: tourism and the income balance. 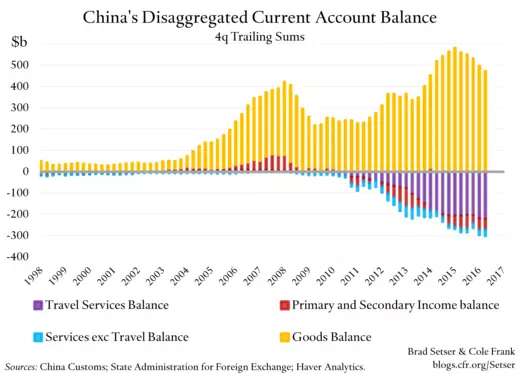 And in both cases, a portion of the adjustment comes from methodological changes in how China counts its current account surplus—the income balance was revised to count the profits that foreign firms earn in China and reinvest in China a few years back. Now, the new numbers are not necessarily wrong. Foreign firms do make profits in China, and do reinvest them. Counting these profits in the current account and adding an offsetting imputed financial account inflow is international best practice. But since no money actually crosses a border if profits from China are retained and reinvested in China, the numbers are hard to verify. The income balance also includes the interest China gets on its reserves, and those numbers do check out: China now gets significantly less interest income on its foreign reserves than it did in 2007 or 2008. Treasury and bund yields are down. And, well, the “true” size of China’s current account surplus matters. If China’s current account (savings) surplus is “too big” right now (the “norm” for China that the IMF calculated in the past implies China should be in rough balance on its current account) the IMF arguably should be a bit more cautious in recommending that China introduce surplus enhancing policies—notably fiscal consolidation. And a bit more aggressive in calling for China to adopt policies that might bring its surplus down. Here the signs are good, the IMF’s concluding statement put new emphasis on strengthening China’s system of social insurance. But the mechanical application of the three percent of GDP current account threshold—and the two percent of GDP reserve growth standard—could nonetheless be a problem. The size of a country’s current account surplus depends, to a degree, on how it chooses to measure its surplus. And the size of a country’s foreign exchange reserves also depends significantly on what a country chooses to count as reserves, and what gets hived off to a sovereign fund or a development bank. It also isn’t always clear-cut. Focusing on simple thresholds has the obvious appeal of appearing to take politics out of any determination, but the new methodology isn’t fail-safe. */ The gap is a bit less apparent now than it was before the latest round of revisions to China’s current account numbers. China is constantly (it seems) adjusting its numbers. **/ One small aside: as tourism numbers rise, spending per tourist sometimes falls, as first time travelers are often on a budget—the dynamics turn out to be complicated. ***/ 2017 may be a different story. There were no reserve sales in the q1 balance of payments, and the proxies for q2 look pretty stable. If you add in the state banks’ growing loan and overseas debt portfolio, China’s state writ large may again be adding to its total foreign assets. Though the net increase in the state’s assets also reflects tighter controls on private outflows.